Watch these quick orientation videos and use this guide to make the most of all Pedal the Cause has to offer! The 2018 Pedal the Cause Handbook covers ALL you need to know about event weekend. Join us for an upcoming Facebook Live Session on Thursday, September 20th at 7pm or Friday, September 21st at 2pm. Get all your Pedal the Cause questions answered in real time! Individual and Group Packet Pick Up at the Chesterfield Amphitheater (up to 10 members per person with a signed Group Packet Pick Up Form*). Today only: pull your car into Park Circle Drive and park there for pick up. Individual Pick Up at the Chesterfield Amphitheater. You can pick up up to 10 packets for yourself and teammates on Friday only. A signed Group Packet Pick Up Form is required to pick up team member’s packets. 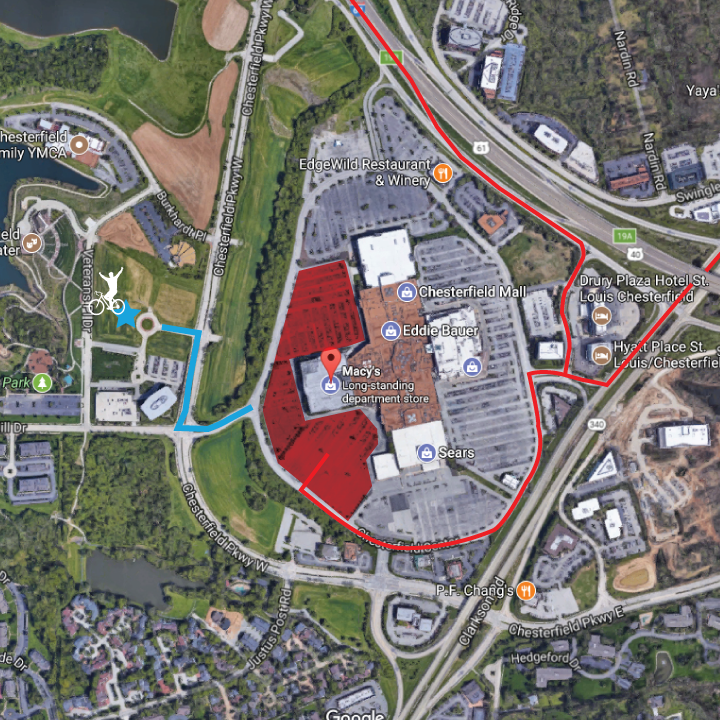 Parking for all participants is in the Macy’s lot at the Chesterfield Mall, which is a 3 minute walk to the entrance to Pedal the Cause (blue star on map). Look for signs for our Disabled Access Shuttle sponsored by Autohaus BMW if you need assistance getting to the Amphitheater. To avoid traffic, exit HWY 40 at Clarkson from 40 W or Wild Horse Creek Road from 40 E, enter the Mall parking lot by the Drury Plaza and Hyatt hotels, and follow signs for Macy’s. On the map below, the red lines represent your driving route, and the blue line represents your walking route to packet pick-up. Make sure to plan your weekend to include food from St. Louis’ top chefs at Taste the Cause and our inspirational program on Saturday night. All registered riders have all access to these events! You can purchase tickets for non-registered guests for Taste the Cause in the PTC Shop here until 9/23 or at the event that evening. You do not need a guest ticket to view PTC Live. Taste the Cause and our Pedal Partner Alley opens at 4:00 pm at the Chesterfield Amphitheater, and runs until 7:00 pm. Make sure to stay for the Pedal the Cause Inspirational Program from 7:00 – 7:30 pm from the main stage in the Amphitheater. It’s an incredible night to celebrate together and not to be missed! Check out our fantastic Taste the Cause chef lineup for 2018!